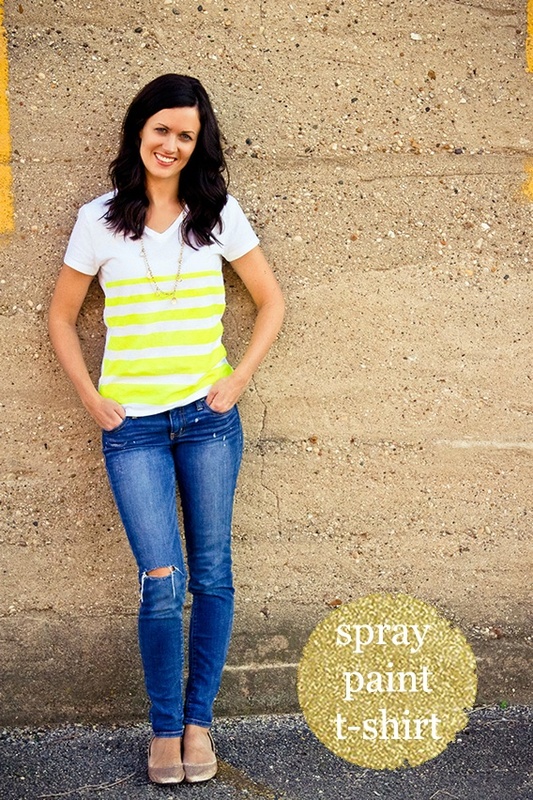 I love stripes and bright colors, so I made this t-shirt using spray paint... yeah who would have thought you can spray paint on clothing... I mean, on purpose. I'm sure we have all done it on accident! first. Get a t-shirt, fluorescent spray paint and some painter's tape. second. Tape off your lines. I also used some paper (you can use newspaper or freezer paper, just any type of paper) to cover the top and the bottom of the t-shirt. You want to make sure that you cover any part of the t-shirt you don't want painted really well because it's spray paint and will go everywhere. I also put a layer of the freezer paper inside the shirt to make sure it didn't bleed to the back. third. I just sprayed a couple of coats to make sure I covered it evenly. And that's it! I have washed it a few times since and the color is still the same and it didn't wear off. It is a little bit stiffer on the spray painted lines but nothing noticeable.